You must follow the secret escape route to escape the prison. Walk up to the cell door and speak with Valen Dreth, a fellow prisoner. Follow the secret escape route through the sewers. Meet back with the Emperor and continue to follow him. Take the Amulet of Kings and exit the sewers. You're told to stand by the window in the back of your cell. The game begins in a bare prison cell with little more to your name than your clothing: a sack cloth shirt, pants, and sandals along with wrist irons. As you explore the cell and become accustomed to your surroundings, a prisoner in the cell opposite yours threatens and berates you. 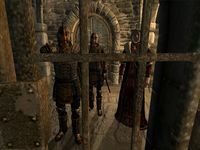 When he's finished, the Emperor of Tamriel, Uriel Septim VII, and three of his bodyguards arrive at your cell and are surprised to find you in it. One guard orders you to stand aside and then the Emperor steps in. As he enters, the Emperor recognizes you from a prophetic dream, and explains that his bodyguards, the Blades, are leading him through a secret escape route. The reason for the guards' surprise becomes clear: the cell you occupy was supposed to be left empty because the route happens to start in your cell. The Emperor pardons you of any crimes you may have committed, and allows you to follow him for a time. You may attempt to steal from the guards or the Emperor. They are set to like you, meaning that if you are caught, they will not try to attack you. However, do note that pickpocketing is very hard at lower levels of Sneak. Claiming the Emperor's silver shortsword: If you attack the Emperor, he will draw his sword. Yield to him by holding the block key and initiate a conversation with him. Around the time that you pick a birthsign, he will drop the sword. Training through assault: When you emerge from the Natural Caverns to rejoin the Emperor, Baurus and Glenroy, you will be on a raised area that they can't get to and they have no ranged weapons or spells. You can practice your Marksman and Destruction skills on them free of repercussions; they are all unkillable. When you're done, jump down and talk to the Emperor and they will stop trying to attack you. The wall crumbles down and reveals another path. 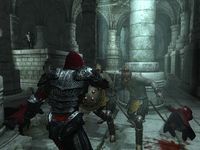 No sooner do you enter the escape route alongside the Blades than you and your companions are confronted by assassins clad in blood red robes and jet black armor, who attempt to cut a path through the Blades to the Emperor. The assassins are unusually strong; unless you are playing on a very low difficulty, it may be wise to sit back and let the Blades do their jobs. Although they are quickly subdued, they manage to slay the Captain, Renault. You cannot loot Renault's armor from her corpse, though you can take her Akaviri Katana, torch, and a Steel Shortsword. Her katana, however, cannot be kept; Baurus will take it from you at the end of the tutorial. After the battle, the Blades—distrustful of you—force you to stay behind and lock the only exit behind them, forcing you to find another way out of the prison. As you look around, a pair of rats suddenly burst through an unstable section of a wall and begin to attack you. Dispatch them in whichever way you please, though this early in the game your combat options are limited to either your fists, a steel shortsword from Renault's corpse, or the late Renault's katana. You can also use the Flare spell that you start with; you don't have to wait for that part of the tutorial. Afterwards, proceed through the hole in the wall made by the rats to discover a lost cavern—and a new way out. The path ahead is straightforward, populated only by a variety of rats, goblins, and undead. There are a few treasures hidden along the path, so keep your eyes open—most are obvious if you're observant enough. Almost everything in the tutorial is preset, though you can still find variations of some items in a few places. After passing through the Natural Caverns, you find yourself on a ledge overlooking the Emperor and his Blades, who briefly debate their tactical options before being attacked by another group of assassins. As soon as you jump from your vantage point to their level, the Blades become infuriated at your appearance and flirt with the idea of killing you on the spot, suspecting you to be an assassin as well. This idea, however, is soon quelled by the Emperor, who demands that you not only be left unharmed but also allowed to follow. He briefly discusses the Nine Divines and fate with you before asking about your birthsign, at which point you are able to select your character's birthsign. After choosing your birthsign, the Blades reluctantly agree to the Emperor's request and Baurus—the more level-headed of the two—gives you a torch to carry to illuminate their path unless you are already holding one. However, you are not required to carry the torch; it is merely a suggestion on Baurus' part. As you accompany the Emperor the group is beset by more assassins. Because the Blades can effortlessly take care of any nearby threats, it is very easy to slip away from battle to retrieve any treasure. Assassins often appear from the shadows in these halls. 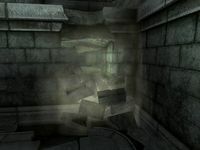 As you and your companions reach the entrance to the sewers, the next area on the escape route, you find the entrance to the sewers is barred from the other side, rendering you unable to go further. Cornered, the group is ambushed by a battalion of assassins, and the two Blades stash you and the Emperor in a small side room with orders to guard him with your life. Attempting to fight the assassins at this point causes assassins to spawn endlessly. As the two seasoned soldiers battle the assassins, greatly outnumbered, the Emperor turns and speaks to you. He ominously says that he can go no further, and that although there seems to be no hope in sight, there is one last heir to the throne not already murdered: an illegitimate son. Quickly, he bestows the Amulet of Kings upon you, and orders you to deliver it to Jauffre at Weynon Priory, who alone knows where to find the last heir. He bids you farewell, cryptically saying that you must "close shut the jaws of Oblivion." Shortly afterward, a panel in the wall slides away, and from it emerges an assassin who mercilessly strikes down the helpless Emperor in a single stroke before turning his sights on you. The Emperor's death is scripted and there is no way to prevent it, as your character is frozen in place during the action. Baurus soon rushes in to help you deal with the last remaining assassin and adds to the already gloomy outlook by announcing that Glenroy, his counterpart, has fallen as well. After relating to him the Emperor's last instructions, he entrusts you with the key to the sewers and questions you on your class. It is at this point you are able to select your Class. After selecting your class, Baurus stays behind to guard the Emperor's body and ensure no assassins follow you. If you retrieved Renault's and/or Glenroy's katana, Baurus will take them from you to be returned to a place of honor given to fallen Blades. As the katanas are scripted to be removed, it is impossible to keep them without the use of the console. Your journey through the sewers is a brief one, and the only resistance you encounter pales in comparison to that of the Natural Caverns. Eventually you will come upon a grate protecting a long tunnel leading outside (it is rather obvious where the exit is; daylight will beam through it), where you have one last chance to alter your race, class and birthsign. Adjust them as you see fit, if at all, save, and exit the sewers to finish the tutorial and be treated to a breathtaking view of the local area and the world beyond. To emphasize: It might be wise to save the game just before you exit the sewers. That way, you don't have to redo the entire tutorial if you decide to start over. Any bounty you may have acquired in-game at this point (such as from attacking the Emperor) will be immediately cleared upon leaving the sewers. From here you are free to continue on as you wish. 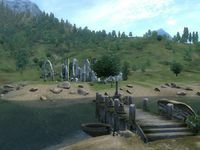 You may continue with the main quest, or you may explore Cyrodiil, doing whatever you please. The brilliance of Oblivion is the freedom it offers in gameplay; you may now experience that freedom first hand. 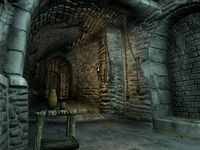 If you are playing Oblivion for the first time, you may want to read the page for First Time Players. Depending on your character's class and how you want to play, consider keeping the Wrist Irons you start with. They have zero weight, and are the only non-armor enchantable item that can be worn on the hands. They are therefore very useful for a non-armored character (such as a mage). Without DLC plug-ins or mods, this is the only set in the game, so choose the enchantment carefully. None of the doors that the assassins come out of are operable. You cannot loot the Emperor's body. If you try, Baurus will admonish you to "Leave the Emperor in peace." If you click and drag the Emperor's body, Baurus will follow the body as if the Emperor were still alive. An achievement will be unlocked upon exiting the sewers. If you have any add-ons, their content will activate all in sequence in a short period of time. These include Dunbarrow Cove, Horse Armor, Unearthing Mehrunes Razor, Deepscorn Hollow, Battlehorn Castle and Frostcrag Spire. They're all optional add-ons, which you might not have noticed installing. Any skill that you advance to Apprentice level before selecting your class and major skills will still have the Major Skill bonus applied. The quest's script contains many commented out "MessageBox" commands containing messages similar to those that appear as journal entries, implying that the Tutorial was meant to be provided by message boxes and not as a quest. The suggestion for the player's class which Baurus makes is based on the specializations (Combat, Magic, Stealth) of the skills that the player advances during the tutorial. The Construction Set Wiki has more details. Quest stages 26, 92, 94, and 96 were cut from the game and cannot be obtained without use of the console. Sometimes the assassins will get stuck up on a ledge. If you jump carefully, you can attack and kill them or shoot them with a bow. It is possible to continually be confronted by the assassins in the area where the Emperor dies. After Baurus tells you to stay with the Emperor, if you avoid getting close enough to trigger the dialogue with the Emperor, you can fight an endless wave of assassins. This is helpful if you wish to raise your skills with little to no threat, as the assassins are weak opponents. However, you may find that your system will begin to lag after so many bodies stack up. 20 To bring up your journal, &sUActnMenumode;. You can use this to view your character's attributes, equip armor and weapons, and choose spells. 28 To ready your weapon or fists, &sUActnRdyitem;. To attack, &sUActnUse;. To block, &sUActnBlock;. 34 Now practice casting spells. To cast your selected spell, &sUActnCast;. If you want to change spells, &sUActnMenumode; to bring up your journal again. 50 Before you can use the bow, you'll need arrows. Check the skeleton to see what it contains. 52 Now that you have arrows, pick up the bow and practice using it. 54 To use a bow, you'll need to have both the bow and some arrows equipped. Go into your inventory and equip them now. 56 Now you're ready to practice with your bow. The bucket near the well will make a good target. To draw and aim, &sUActnUse;. Release it when you're ready to fire. 58 Nice shot! You can retrieve arrows from the world, as well as recovering some of the arrows you fire into enemies. 64 You have found a Mortar and Pestle. Equip it to create potions or poisons from ingredients with like effects. Your Alchemy skill will make your creations more powerful. 65 You have found a Repair Hammer. Equip it to repair your weapons and armor using your Armorer skill. Damaged weapons and armor are less effective, so it is wise to keep them in good repair. 72 Your Health is low and you are close to death. Increase it by drinking potions, casting heal spells, or sleeping. The red bar at the bottom left displays your current Health. 73 Your Magicka is low and you may not be able to cast spells. Magicka returns slowly on its own, or you can increase it by drinking potions or sleeping. The blue bar at the bottom left displays your current Magicka. 74 Your Fatigue is low and you cannot do as much melee damage. Fatigue returns slowly on its own, especially while walking instead of running. The green bar at the bottom left displays your current Fatigue. 75 You have picked up more than you can carry. In order to move again, you'll need to drop some items, so &sUActnMenumode; to bring up your journal. 80 That goblin up ahead hasn't seen you yet. You may be able to sneak by him. To go into sneak mode, &sUActnCrouch;. 82 Notice that the crosshair changes to an 'eye' while you are sneaking. If the eye is dim, no one can detect you. If the eye is bright, someone can detect you. 84 Finishes quest You now must choose your class. The major skills of your class will start higher than your other skills. You will increase your level by raising these major skills. 90 The red arrow on your compass shows the direction of Weynon Priory. You can walk there by following your compass, or use your world map to travel there directly. Or you can set off in any direction and begin exploring the world on your own. Good luck! 92 To view your quest log, &sUActnMenumode; to bring up your journal. 110 In each attempt to persuade, you must Admire, Boast, Joke, and Coerce. Each of these actions raises or lowers the NPC's disposition. Don't take too long, because the NPC's disposition is steadily falling. 120 As you highlight each possible action, the NPC's face shows his reaction to it. He will Love, Like, Dislike or Hate each action. His disposition goes up if you select a Loved or Liked action and goes down if you select a Disliked or Hated action. 130 The potential gain or loss for each action is based on your Speechcraft and how full the wedge is. Try to select fuller wedges when they are aligned with actions the NPC likes. Try to select less full wedges when they are aligned with actions he doesn't like. 140 All of your possessions have been confiscated by the guards. You will get them back when you have served your sentence. Activate the bed to begin serving your sentence. 150 Combine ingredients with like effects to create potions and poisons. Your Alchemy skill will make your creations more powerful. The more potions you create, the higher your alchemy skill will go. Use additional apparatuses to improve the strength of the potions you create. It is possible to use the console to advance through the quest by entering setstage MQ01 stage, where stage is the number of the stage you wish to complete. It is not possible to un-complete (i.e. go back) quest stages. See SetStage for more information. This page was last modified on 17 September 2018, at 19:24.